September is settling in. Early apples like Zestars and Paula Reds crowd the co-op bins. Sweaters are draped over mannequins' shoulders in retail shops. Perhaps you needed a sweater this morning, even if the forecast predicted sun and 75 degrees by noon. Tempted as I am by the prospect of mulled cider and whole-roasted pumpkins and beers sipped al fresco as the leaves begin to turn, summer needs a last hurrah. Relish the creemees and the last of the summer farmers markets. Eat outside, even though it’s now dark at 7:30 p.m. And gorge on the late-summer tomatoes. A late-summer tomato is the epitome of the fruit itself — heavy and sweet, with a tomato perfume so strong it leaves its scent on your fingertips. Tomatoes are now at the height of their fleeting glory, giving us the last dregs of their summer deliciousness before bidding farewell until next year. Few foods are as aromatic and intensely of-the-season as a damn good tomato. As an ode to tomato season, here are seven ways to stir your appetite for the last gems of the summer, as told by Vermont chefs, farmers, artisans and other tomato lovers. 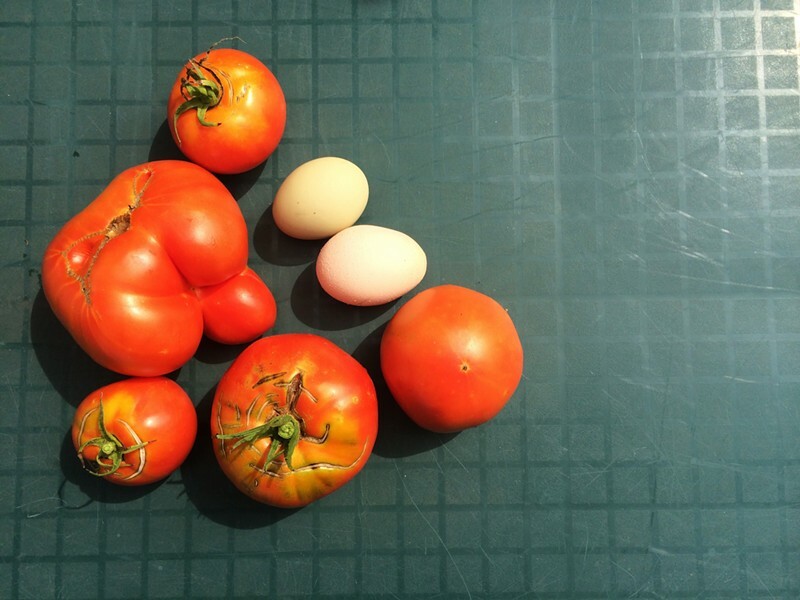 My question was simple: How do you eat your late-summer tomatoes? “We have BLTs on Tuesdays in August and September for staff meal. No joke, that’s my favorite way to enjoy a tomato. It’s just simple. Good tomatoes, mayo, bacon left over from Sunday’s lunch service that we’ll render off; some bread, but doesn’t even have to be good bread. I like simple. We have a tomato salad with berries and garlic ice cream on the menu. It’s really good and complicated to prepare, but, you know, the simpler is the better. I also love grill bread, Spaniard-style: grilled bread rubbed with olive oil, a clove of garlic, a smashed tomato and some coarse salt." Of course, most of the time we eat tomatoes straight up, like in a raw salad with cucumbers and herbs. Actually, most of the time we eat them in the field while harvesting. We grow a bunch of funky heirlooms, and the best way to enjoy them is fresh and simple without a bunch of upgrades. Recently, we’ve started grilling tomatoes whole with spices and olive oil. The skin starts to crack a little, which gives the tomatoes an interesting, charred taste." "There are the two traditional ways from my childhood. One is stir-fried tomato and scrambled egg. Very wholesome meal. My family [always had] this dish. My children grew up on this dish. In China, we’d get a tomato and pour hot water over it. We'd peel the skin, and then sprinkle it with sugar. It's like a dessert. When I was a kid, that was a treat. We'd peel the skin, because in China they peel the skin on everything. They peel apple skins, grape skins, everything. Here, I don’t think people always peel the skin like that." "My favorite way to eat a tomato is in a tomato sandwich with mayo and salt and pepper on soft white bread. With potato chips and iced tea on the side." "I personally love to pick a tomato fresh out of the garden, so it’s still warm from the sun, and slice it with a little fresh mozzarella. 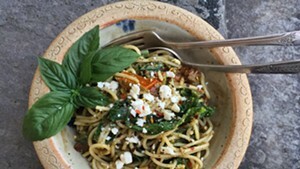 I add a little basil, and drizzle balsamic straight over the top." "Well, I have a couple of ways [to enjoy tomatoes] this time of year. One way is a good tomato jam, served as an accompaniment. When things cool down, I start thinking about tomato jam over something like a Caprese, although a Caprese salad is another of my favorite ways to enjoy tomato season. My mind is starting to hover towards fall at the moment, since I’m coming up with a new menu for Mary’s. I have a pig's trotters cake in mind. It’s a savory cake with salt, pepper, fresh herbs and ground pig's trotters, which is an underused cut of meat that’s tender and flavorful and delicious. The cake will have smoked cheddar cheese that we smoke in-house; it’s like a pork quick bread. I cut the cake thick and sear it in butter, then plate it like a pâté. You can eat it hot or cold. I love to serve it with the tomato jam. The tomato jam is just tomatoes with cinnamon, allspice, nutmeg … all cooked down for about 12 hours. I’d cut the dish with some pickled onions served alongside, as well. You can serve [the cake] for lunch, too, with poached eggs and some of that tomato jam Hollandaise." I've been eating tomatoes twice a day, lately; there are so many swelling on the vines in my garden that both I and the rabbit under my porch are getting our full share. I like them warmed in the pan with fried eggs on top; scattered over homemade pizza; sliced and sprinkled with sumac and herbs, or smashed with a fork and smeared on toast with cream cheese. Then there are the tomatoes meant to be eaten right out of hand; a bruised-up Early Girl inhaled in the back of the restaurant kitchen during a lull on the line; a gnarly-looking Brandywine handed to me by Ms. Janice, who owned the farm I worked on during summers as a kid. Those tomatoes are the most memorable, eaten in four great bites like an apple.